Busby and Wilds is quite a walk from my home in Hove, but tonight the lure of a great burger beckons me down Kemptown way. 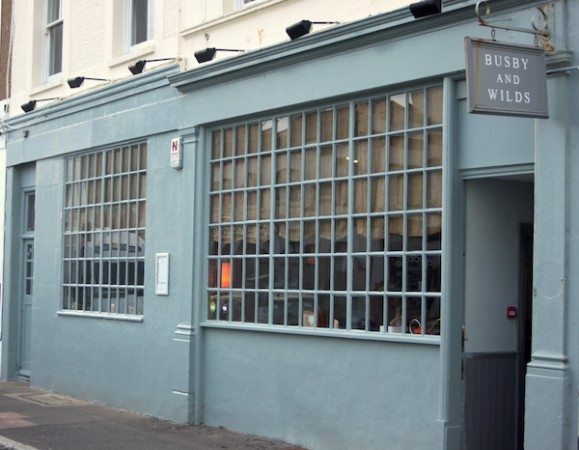 Having sampled their wonderful roasts and heard only great things, I am really quite excited about Busby and Wilds take on what is fast becoming one of Brighton’s dine-out favourites. No longer about fast food and bad ingredients, the ‘gourmet’ burger is a staple part of a food lover’s diet. 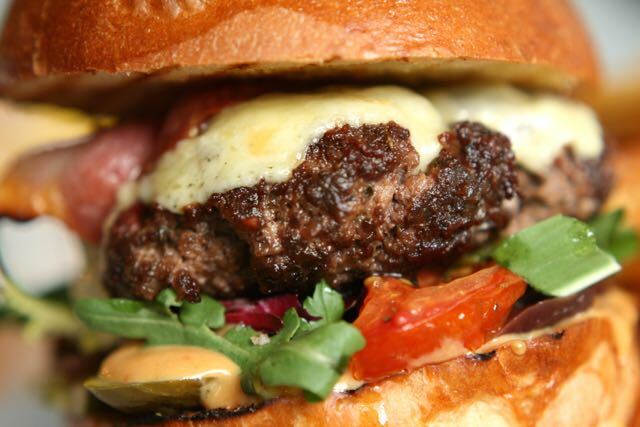 Everyone is having a go at producing the perfect burger; some are getting close or even achieving it, but one thing’s for certain, with every great burger consumed, standards and expectations are raised! 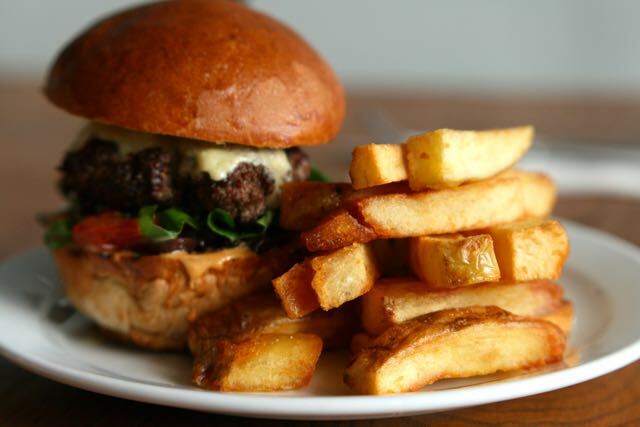 It’s ‘Burger Tuesday’ at Busby and Wilds and The Brighton Burger Lovers are out in force. 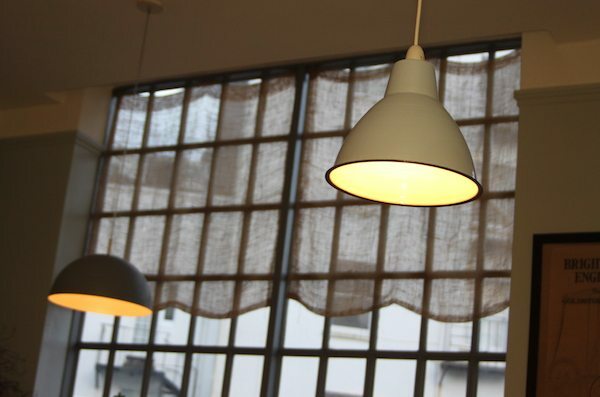 The perfect setting for good, honest, comfort food – the restaurant is buzzing. The lovely staff take it in their stride, greeting us with a smile and commenting on how busy they are tonight. They quickly get us a drink and offer us a seat at the bar while they prepare our table – we are half an hour early so I take this opportunity to read the menu, check out the décor and take in the vibe. Busby and Wilds has a wonderful selection of draft ales, one of which – the Firebird ‘Pacific Gem’ – is recommended to my partner. It is a golden ale; I am told – and I can see – that it is very drinkable! I have a glass of Malbec chosen from their equally thorough wine list. Busby and Wilds seems to be somewhere between a pub and a restaurant, which makes for nice relaxed dining. It is spacious and modern, but retains a sense of traditional pub dining with the rustic bar and the introduction of some interesting furniture pieces adorned with retro trinkets. The hanging art colouring the white wash walls is a nice touch; I particularly like the fact that a lot of the local scenes I have passed on my walk over here. Busby and Wilds has a lot to offer hungry Brightonians. 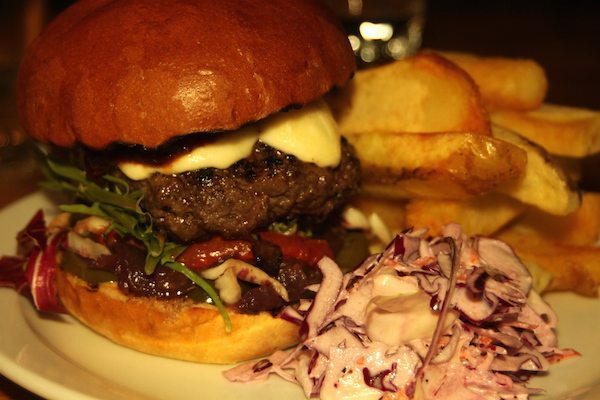 The ‘Busby Burger Night’ – a burger and a drink for just £12 – is not the only great value for money night the folks at Busbys will treat you to. It doesn’t take me and my partner long to notice the sign by the bar advertising another wonderfully tasty deal. On Wednesdays, why not spoil yourself and a friend with two main courses and a bottle of house wine for £28 – you can’t argue with that. 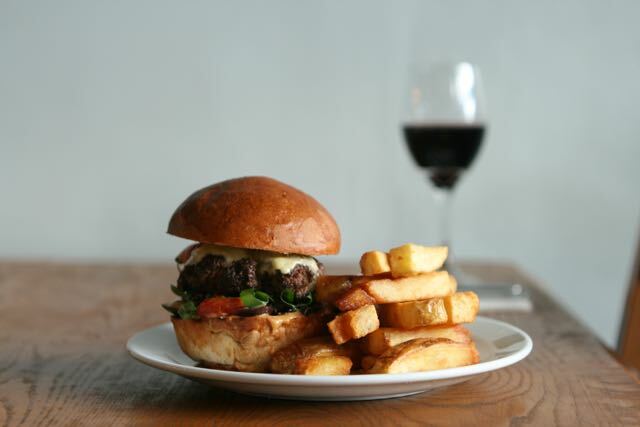 Especially appealing to us after we peruse the perfectly selected pub classics on the menu: Beef and Ale pie, Busby Fish and Chips, Sirloin Steak and Roasted Shoulder of Lamb to name a few. Now seated, we glance at the menu and make our selection within seconds. This literally never happens… what can I say – we know our burgers and we know what we like. For me, it can only be the ‘Firestarter’. With the promise of that chilli kick I so often crave, there might as well be just one thing on the menu. Luckily for my partner there are more. Almost as enamoured with a BBQ as I am with a chilli, his imagined image of the ‘Smoke Out’ jumps off the menu and smacks him the face. Nothing else stands a chance! Busbys have got the balance just right. A modest menu with a healthy selection of different flavoured toppings, a chicken option and a spicy bean burger for the veggies; there’s a good chance you’ll see your favourite, and if not, trying something new promises to please. Reassuringly as well, your burger won’t be served to you on his lonesome; he is buddied up with his old friends ‘chips’ and ‘coleslaw’ ensuring seriously satisfying portion sizes. And for those of you who love to indulge, there are also ‘extras’ that can be jammed inside your bun should you wish – cheddar, stilton, smoked cheese, jalapenos or bacon. And sides available to order too – making sure it’s a taxi ride home, not a walk. It’s a beautiful thing – a perfectly formed tower of meat cheese and bread. The golden brioche almost glistens and is so welcome on my plate; I’m always bitterly disappointed when I’m served a burger with any other kind of bun. It is a multi-layered pile of pleasure, with a bold and meaty centre. The patty itself is fat and medium cooked, browned and pink in the middle; something which is fine by me – safe in the knowledge that only the best meat has gone into this burger. All in all, it is a surprisingly colourful plate of food, helped hugely by the purple slaw, the slightly escaping, oozing tomato and little leaves of lettuce. The first bite delights me. The flavour combinations are good, but not overwhelming. The beef is the driving force behind this burger – well-seasoned, melt-in-the-mouth tender and plentiful inside the bun. The chilli jam is shiny, sweet and spicy, there are also jalepenos peppers, but with the melted mozzarella cheese it balances out the heat, adding an edge to this classic sandwich. Personally, I would have added a touch more heat, but my partner will tell you, I have a strangely high tolerance for spice. 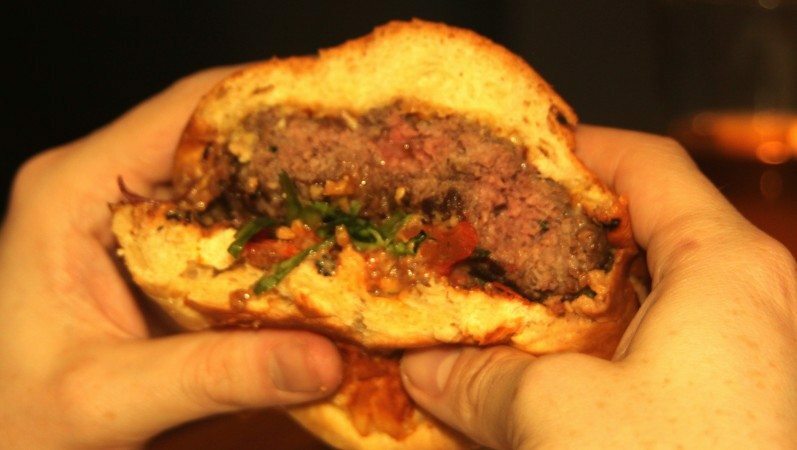 My partner’s burger is everything it promised to be, with a smoky bacon jam in place of my chilli, home made BBQ sauce and smoked applewood cheese, recreating all the flavours of a summer-time BBQ. 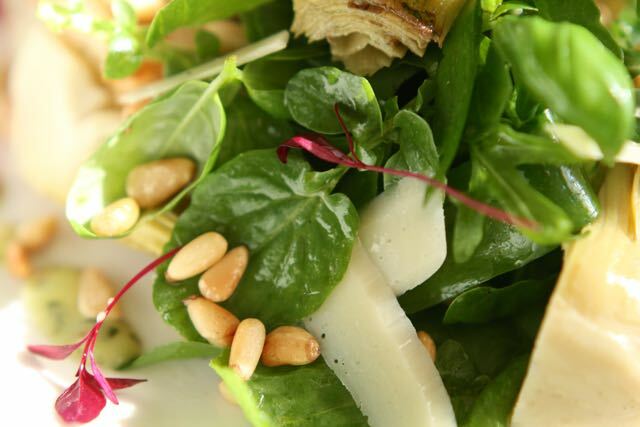 The cheese and the salad bits – including the much loved gherkin, slow roasted tomatoes, sweet onion jam and burger sauce, all of which are made in house – bring the burger back down to earth. Homely and honest food, grub like this is such a joy to eat. Our napkins last about two seconds and so do our burgers! The chips don’t mess around either. Massive chunks of rustic potato – skin on – climb up from my plate, Jenga style – a thoughtful bit of presentation. The slaw is a really nice change of pace, fresh and crisp in contrast to the formidable burger and the chips. Also joining the party, we are presented with four different dipping sauces for our hefty sides: BBQ, mayonnaise, some more of that yummy chilli jam, and good old Tommy Ketchup. It might seem strange that I saved this mention until last – but my god these were good! I absolutely love onion rings, but let’s face it, they can be disappointing. The fact that we didn’t order them – despite some serious consideration – but they were brought to our table anyway, tells me Busby and Wilds are really proud of these bad boys… and they should be. 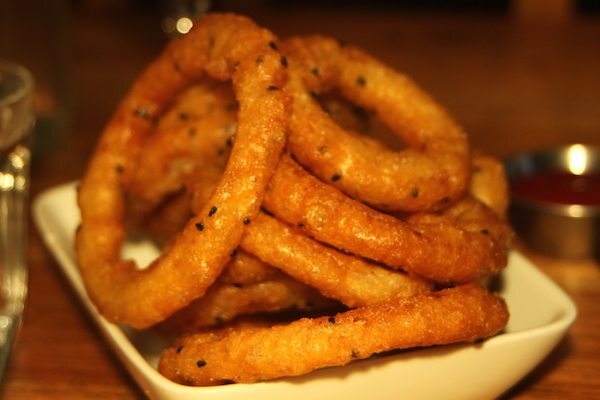 Lightly beer battered, generous circles of onion and peppered with little black onion seeds – the best onion rings I’ve tasted! I am sorry to say that there was just no room for both; for me there was no competition, a few chips were left uneaten at the end of the meal. I have really enjoyed being a part of this Tuesday night at Busby and Wilds. It ticks all the boxes – relaxed atmosphere, punctual bubbly service-with-a-smile, great drink, great food, extremely full belly, very happy customer! In my opinion, it is good value for money, and the locals clearly know this too; there was barely a spare table all night. If you live the other end of the city – like me – and think it’s too far to venture for a burger, believe me, it’s not! And if you walk home afterwards, think of all those burger calories you can burn off. For the record… I got a taxi!